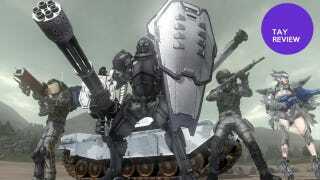 When Earth Defense Force quietly released to the bargain bin in the U.S back in 2006, it slowly but steadily grew a cult following among gamers new to the series. Set in the near future, the earth is being overrun by giant insects and the aliens who made them. It was up to the player (and a friend, in split screen) to fight off hundreds of bugs and robots and save the earth. The graphics were shoddy, and the AI was idiotic, but blasting ants into the horizon and destroying skyscrapers with even the smallest of explosions (like grenades) was arcade fun like I hadn't played in years. Now 7 years later, we get to do it again. Does 2025 carry it's own weight, or are the devs trying to cash in on a flue success? Most FPS go for the realist route. 2025 goes for the arcade style "fire at everything that moves", and with infinite ammo (still need to reload though) you can pick whatever weapon you like and just go to town on the alien menace. While the classic soldier from 2017 returns, we also have 3 new classes to stem the onslaught. 1st is the Air Raider, which specializes in support, calling down air strikes and player driven vehicles. I didn't get a lot of time with him, since he works best with a full team of 4 players. 2nd is the Wing Diver, a female only soldier equipped with a jet pack, and wielding lighting and lasers. Lastly is dual wielding walking tank called a Fencer, which specializes in the heaviest of weapons, and soaking up every bullet he can catch. 2017 had around 150 weapons, and 2025 ramps it up to near 500. The variety is top notch as well, such as Assault Rifles, Shotguns, miniguns, force blades, lighting sniper crossbows, turrets, cannons, massive fist jackhammers, and even more that I haven't seen. Every time you get a new weapon, you'll want to race to the loadout screen and see what it does, and its addicting. Add in that since there is infinite ammo, you bring the guns you want, and focus on killing. Weapons are dropped when killing any enemy in a stage, and it will be specialized to your current class. You won't know what you get till you finish the stage and get to the completion screen, but it doesn't slow down the mad dash everyone will take towards them when they see the neon green boxes fall. Health also steadily increases as you play, as in addition to weapons dropping (and health kits), red armor crates will drop that increase your max health by 1 for each you pick up. This leads to a steady increase of power as you play, while maintaining the quick and frantic nature of the game. Levels last anywhere from 3 to 15 minutes, which means quick bouts of bug stomping, without making you wait too long from trying new guns or moving to a new location. There are 85 levels, and 4 difficulties. Each difficulty brings it's own list of weapons only obtainable to it, giving it the same stair step feel of loot hoarders like Diablo. All the previous stuff is pretty moot if it wasn't fun right? Thankfully I never got tired of blasting a cheeky spider in the face and watching him soar off into the sky, or firing rockets everywhere and destroying the city you're there to protect. While the character models have improved since 2017, the levels still have a bit of the PS2 era graphics going on. Didn't bother me, but your mileage will vary on your need for the cutting edge. While there are plenty of levels, there are only a handful of map types, such as the desert flats, the beach, the city, or the tunnels. Each stage comes at them from a different angle, and have different enemy types, which help make up for the lack of level variety. You'd think with the dated graphics, it would be able to handle them. Often though, I saw slowdowns to 5-10 FPS, though it only lasted for 5-10 seconds, and killing enemies usually fix the problem pretty quickly. The load times can also be really taxing, usually taking between 1 and 2 minute. Pray for no cutscene, because then you get 2 load screens in a row, and the cutscenes usually aren't interesting or useful, since most story development is over the radio during gameplay. Luckily the scenes can be switched off in the menu, to help with the loads. I understand that some people like friendly fire, though I don't think it works well here. When there are so many enemies on the screen, its quite easy to blast a buddy to death, or you're launching off a rocket only to have a stray ant walk right in your face and you end up killing yourself. If you're looking for some solid, if campy, co-op fun, its hard to go wrong with EDF 2025, especially since it's $10 cheaper than the average new release, at only $50.